What do Lotus flowers and Keystone Ridge Designs Schenley benches have in common? They both can be enjoyed throughout the summer at Echo Park Lake in Los Angeles, California. As one of the oldest and most beautiful parks in L.A., today's blog features this historic setting and our involvement in the major rehabilitation that has transformed the park. In the late 1860s, the area was originally developed as a reservoir to accommodate rapid population growth in Los Angeles. In response to the city's need for more public parks, Joseph Henry Tomlinson, landscape architect and Superintendent of the Department of Parks, designed the reservoir area into a recreational park. 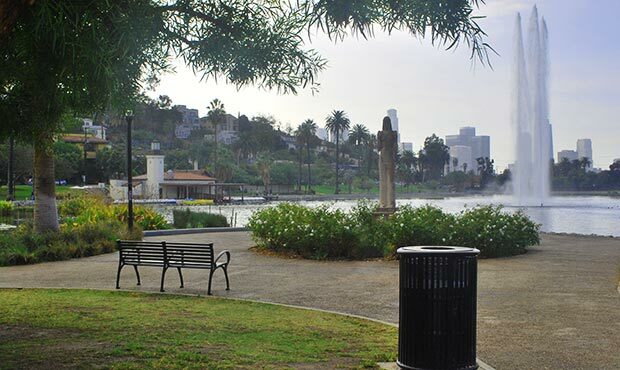 Officially established in 1892, Echo Park Lake has seen many changes and additions throughout the years. Its rich history includes the construction of a boathouse in 1932, the installation of the Lady of the Lake statue in 1937 and the addition of the lake's prominent fountain prior to the city hosting the 1984 Olympic games – all of which still remain today. With the L.A. skyline as its backdrop, the park currently flourishes as a place to enjoy nature and find respite from the bustling city. Getting the park up to its current beautiful state, however, did not happen on its own. In 2006, Echo Park Lake was identified by the State of California as an impaired water body. Around the same time, Los Angeles voters passed Proposition O, which authorized the city to fund projects that prevent and remove pollutants from waterways. Echo Park Lake was one of the projects to benefit from the Proposition O initiative. What started as a stormwater improvement project expanded into a multimillion-dollar rehabilitation to preserve the history of the park while creating a more sustainable and inviting destination. In 2011, Keystone Ridge Designs became involved in the site furniture selection process. While working with the landscape architect, Josh Segal (then of AECOM), our Schenley benches were chosen as an early favorite to provide the perfect balance of historic charm and modern design. With the addition of center arms on the benches, it encouraged proper usage and deterred vagrancy. 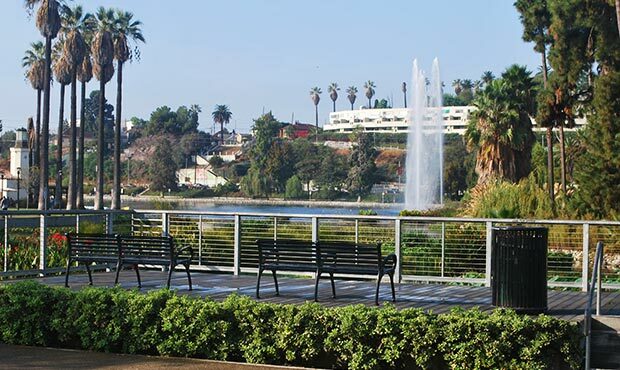 "As landscape architects, our goal was to respect the rich history of Echo Park Lake while balancing authenticity with sustainability, recreation, durability, and habitat. The Schenley bench helps evoke memories of an early 19th Century park bench, but does so in a clean and bold way." The park was closed for two years to facilitate the renovations until it reopened in June of 2013. It was then that pedestrians found newly constructed wetlands, restored lotus plantings, educational signage, lighting, additional vegetation and our Schenley benches strategically placed throughout the new pathways. Our Reading litter receptacles were also incorporated and customized to accommodate extra-large trash capacity. 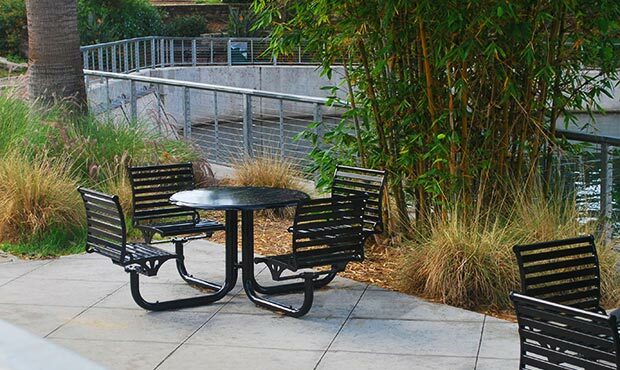 More recently, we worked with The Los Angeles Parks Foundation, a nonprofit raising private funds for LA’s 450 city parks, to provide additional benches as well as coordinating Schenley table sets. 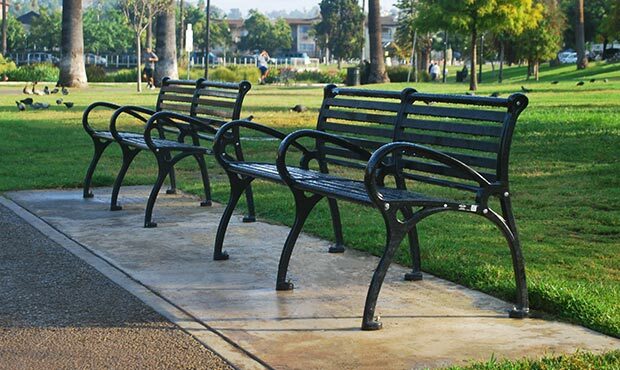 Adding the new furnishings aids the Los Angeles Parks Foundation's mission to enhance, expand, preserve and promote public recreation, parks and open space for the people of Los Angeles. One of our favorite things about this park is how often we catch a glimpse of our benches in the background of TV shows or commercials that have been filmed at Echo Park Lake. Between the proximity to the filming industry and the picturesque scenery, it can be an ideal filming location. Many of us at Keystone Ridge Designs have caught ourselves hitting the pause button to point out our Schenley with center arms in anything from cell phone ads to pharmaceutical spots. Since the renovations, the park clearly continues to be a center of outdoor activity. With fishing, pedal boats, picnic areas, walking paths, festivals, and the iconic lotus blossoms that are in bloom June through August, you can always find something to enjoy at Echo Park Lake. But in our opinion, the best place to view it all is from a Keystone Ridge Designs bench.